As you may know, I was in New York last week. I got home yesterday feeling very disoriented; it’s not just down to jetlag, it’s as if I’ve come to land in a strange place I barely recognise. That place is normality. My son S and I thought we were going for a relaxing time seeing friends in Brooklyn and doing some of our favourite things in this amazing city we know well; instead, like millions of others, we found ourselves at the mercy of Sandy, the most devastating superstorm to hit the Northeastern seaboard in 150 years. A lot of you followed my on the ground account and pictures on Twitter and I’m trying to record my reflections now it’s over. (I’ll do a travelogue on Brooklyn next week.) It’s not a case of ‘before I forget,’ because I doubt anyone who lived through this disaster ever will. Do you have a friend you can’t believe you haven’t known for years? I first met Donna Zaengle 18 months ago on a trip to research my novel when we stayed at her B&B, Emilia’s Retreat in the historic neighbourhood of Ditmas Park in central Brooklyn, known for its beautiful wooden houses and tree-lined streets. On both visits, we’ve rented the basement apartment in Donna’s huge house. She emailed me just before we left London saying there was ‘weird weather’ forecast. I didn’t realise then she meant a hurricane (though it was later downgraded to superstorm). 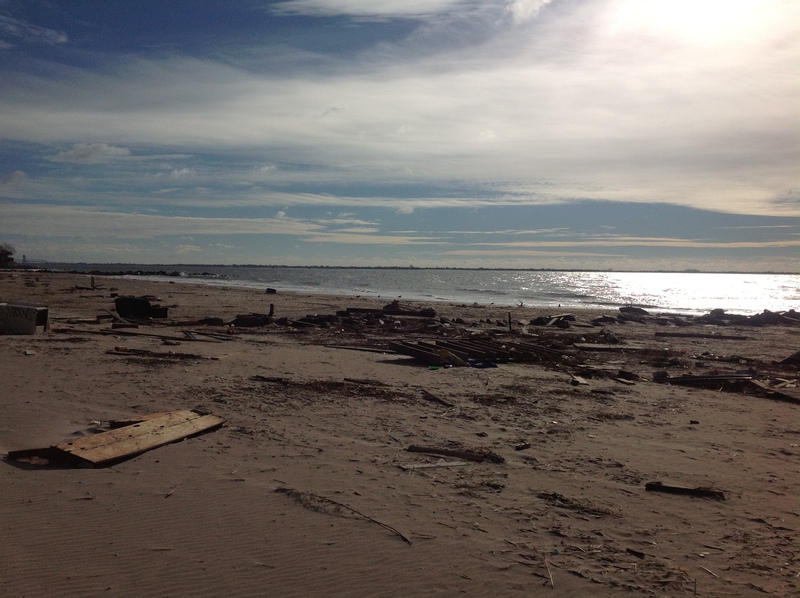 Our experience of the week’s events would have been completely different if we hadn’t been where we were in Brooklyn, away from the shore and not at risk of serious flooding. The electric cables are also underground there so we didn’t lose power. We were very lucky not to witness the storm at its worst either when it was happening or in the aftermath. That being said, it was still pretty frightening and dramatic. The weekend before Sandy there was an ominous calm before the storm atmosphere with lots of speculation. Weren’t forecasts often wrong? Would it just blow out to sea? How much damage could it possibly inflict on the mighty, unstoppable New York City? Nobody had any idea how bad it would be. The devastation this storm left in its wake is unprecedented, a sobering reminder of what nature can inflict on our high-tech, developed society and how powerless we are to do anything about it. S and I spent much of Saturday 27 October in Central Park because I had a feeling we wouldn’t make it back (I was right, like many things, all parks remained closed the rest of the week). We walked around the reservoir and admired the downtown skyline reflected in the water. Along with runners doing their final training for the New York Marathon that should have taken place yesterday, we admired the stunning fall colour in gorgeous shirtsleeves weather. On Sunday there was a planned shutdown of the subway at 7pm which enabled the MTA to avoid damage to the trains by moving them to shelter. Announcements were made telling people along the New Jersey coast and the areas of NY liable to flood to evacuate their homes – many complied, some didn’t. In Brooklyn this included the Brighton Beach/Coney Island neighbourhoods just a few miles south of where we were, in Queens, the Rockaways and Long Island, Staten Island and parts of lower Manhattan (much extended after the storm when power was lost from the tip of Manhattan at Battery Park all the way up to 34th Street). On Monday 29 October, everyone was told to stay indoors and we spent the day up in Donna’s house glued to the Tracking Sandy coverage on TV. Nobody seemed sure when it would ‘make landfall’ south of Atlantic City and it turned out to be several hours earlier than expected. Meanwhile in Brooklyn the winds were starting to howl, it was unnaturally dark and raining heavily and the hundred year old house was starting to rattle like mad. I’m including this dreadful quality footage I shot around that time (YouTube has messed up the resolution) just to give an idea of the noise and the movement. I had to stop filming before I got blown off the veranda. We played Monopoly and dominoes and watched Home Alone 3, Donna fed us grilled cheese and leftover stew and took very good care of us, for which I am very grateful. It was really cosy and reassuring, much more than if we’d been alone in a hotel room. I’m a bit ashamed to admit that down in the basement, where the noise was much reduced, S and slept through the night as Sandy created havoc. By the next morning, we had cabin fever and ventured out, warily, along with the rest of the neighbourhood. 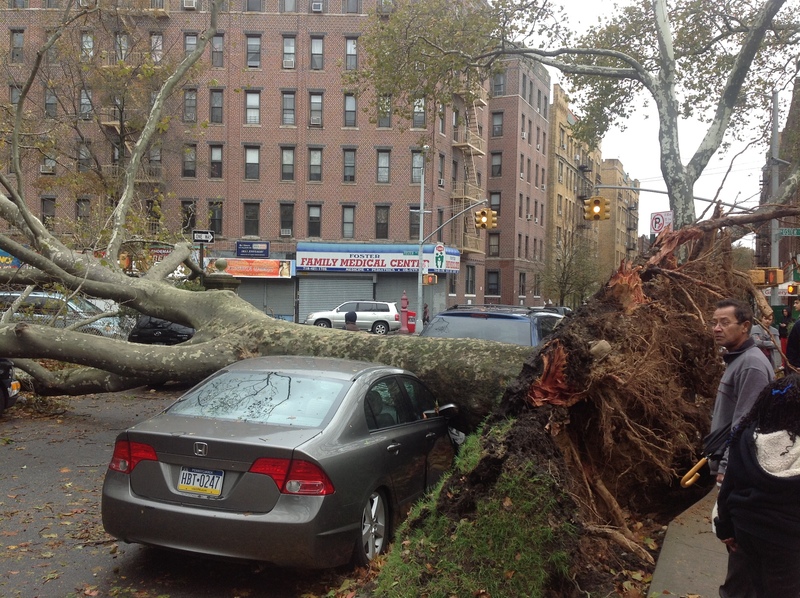 Ditmas Park was mostly affected by the winds because of the high number of old large trees, many of which were now lying across roads, smashed into cars or embedded in the front of houses. Some had splintered right down the middle, some pulled up the sidewalk as they went. Falling trees were responsible for some of the 111+ storm related deaths, including a young couple out walking a dog on Ditmas Avenue not far from our house. The dog survived. For much of the week, the city was brought to a standstill that has never been seen before. A combination of power outages and flooding in tunnels shut the subway down completely for days and even by the time we left it wasn’t possible to cross from Brooklyn to Manhattan by train. One day we walked over the Brooklyn Bridge to find lower Manhattan a complete ghost town, few people on the streets, everything closed, no traffic lights. It was so depressing, dystopian almost, that after half an hour wandering around aimlessly we headed straight back to Brooklyn. The next day shuttle buses were organised to take people over the bridges and I felt triumphant when we made it to the Met in the afternoon for the Regarding Warhol exhibition which I particularly wanted to see (it was good). However, the return trip was another story when at 7.30pm we had to stand in line for two hours in complete darkness (no streetlamps or lit shopfronts) and near silence to squeeze onto a packed bus back. It was one of the most scary and surreal experiences of my life, with lots of NYPD policing the line, and S found it very distressing. There was no way I was going to subject him to that again. Donna ended up being off work all week as she works in a high school and one of the unexpected benefits was we got to spend a lot of time hanging out with her. She insisted on driving us around Brooklyn because the transport situation was so chaotic. I’m sure the images in my mind of the morning we spent walking from Brighton Beach along to Coney Island will never leave me – again, it was almost deserted and gave us the feeling of having survived something apocalyptic, the beach strewn with the most astonishing collection of debris lifted by the waves and hurled back to shore. 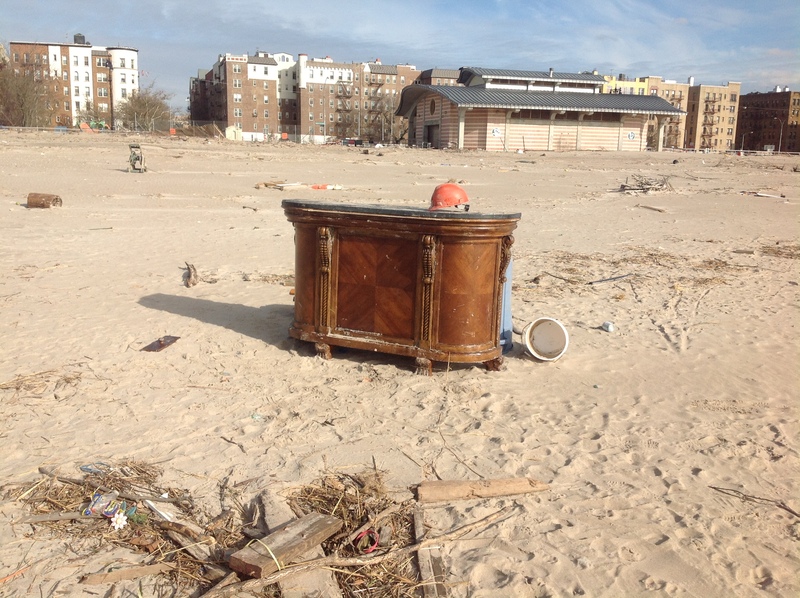 It was absolutely bizarre finding enormous stretches of boardwalk, staircases, sofas, and a heavy sideboard with a marble top. The promenade and the nearby streets were covered in sand dunes. In order to avoid freaking S out, we avoided newspapers and watching too much TV coverage in the aftermath. I was so pleased for him that he got his exciting American Halloween. 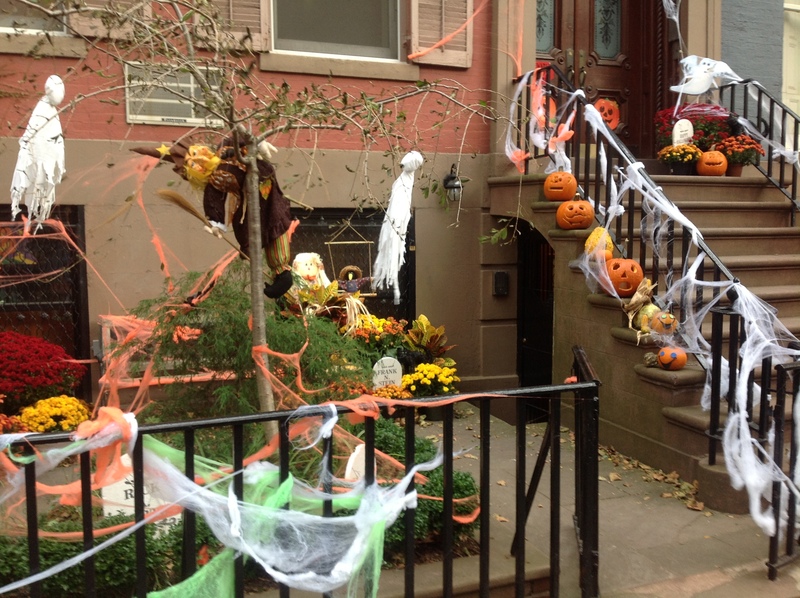 It was fantastic going trick or treating in the neighbourhood – before dark because of the danger from unstable trees. The resilience and sense of community spirit was really palpable and touching – no surprises there. We mostly stayed in Brooklyn which is certainly no hardship– we got to see all the friends we wanted to see and did some fun things. Many people pointed out what a gift of material I’d been handed as a writer which is true, especially as I’m already used to writing about Brooklyn and America. I think writing about the storm will be easier when I fictionalise it and take us out of the story – it’s a challenge to convey what it was really like, how it touched on every sense and emotion. It wasn’t really until our last evening, when Donna and I were drinking wine and watching the televised (no live audience) benefit concert for the victims of Sandy that I fully took on board the extent of the devastation. As always, it’s the human stories that give such things dimension. Staten Island, again not far from us, was decimated by the storm. A woman in her 60s was shown crawling along the seafront in search of her house which she found a mile from where it had stood, a pathetic mound of shattered sticks. Suddenly, beneath her feet, she spotted the only photograph she has of her parents’ wedding in the 1940s, covered in weeds and soaked in seawater. In the concert Bruce Springsteen, synonymous with New Jersey and the lot of the ordinary American and whose own neighbourhood was destroyed, sang with closed eyes and gritted teeth. Temperatures are near freezing now in New York City and an estimated 40,000 people no longer have a home or any possessions. Survivors who evacuated talk about having saved themselves only to be left with nothing. Conditions are dire at temporary shelters, stretched to the limit with people who haven’t slept properly, washed or changed clothes for a week. Another nor’easter storm threatens to batter the same places again a couple of days from now. I don’t care that we didn’t have the trip we expected. We can return another time. What I can’t stop thinking about are those who’ve lost people, places and things they can never get back. Technical problems have prevented me adding any more photos – I’ll upload the rest when I figure it out. There was so much interest in the Write What You Know? post that I invited historical mystery writer D E Meredith to join me as Guest Author to expand on her intriguing answer ‘I write what I DON’T know’. Find out why in her post next week. « Write What You Know? My goodness, what an experience to stumble into! As you say, it’s the human experience of the storm that’s so affecting – the story of the woman on her knees searching for the remains of her house is particularly upsetting. The word ‘awesome’ if often overused, but it certainly applies here when we are faced with the power and forcefulness of nature. You paint a very vivid picture of what it was like to be holed up there during the storm – it actually sounds quite cosy and nice, but I’m sure it was frightening too. Glad you’re back safe and sound! I think it’ll take me a while to fully process the whole thing now I’m home. On one hand it was incredible to be part of something so dramatic and historic, and on the other, it was very tense, strange and disruptive for us personally, and obviously far worse for many others. It would have happened with or without us but I think on balance it was something to have experienced! Two comments; 1) it was terrifying to see how, in the world’s largest economy, climate chance was not a topic in the presidential election. This seems to be changing now with some reasonably informed discussions about possible cause and effect relationships. 2) have a look at Eric Larson’s “Isaac’s Storm” (published in 2000, now probably available second hand for pennies in paperback on Amazon) about the hurricane which hit the town of Galveston in Texas in 1900 with the largest loss of life caused by a hurricane ever in the USA . It is writen in the form of a documentary. Could be useful background material. Thanks for the book tip Tom and yes, the comment about the lack of debate on climate change or mention of it in the context of this storm was made by almost everybody I spoke to in Brooklyn. It doesn’t go away because nobody dares talk about it. I followed your twitter reports with interest and was amazed at your pics showing the destruction Sandy caused in your neighbourhood. I’m glad to hear that you and your son arrived home safely but with a tale to tell and heartfelt thoughts for those still suffering. I’m sure it’s an experience that will stay with you both forever and a permanent reminder of the power of nature. It was a very intense week and I’m quite taken aback by how much it’s affected me given that I don’t think we were in any great danger – although everyone was very wary of the trees left standing. There was something particularly striking about it being New York of all places brought to a standstill – as you say, nature usually wins out in situations like this. Thanks for posting this, Isabel. It’s really moving to hear a first-hand account of the devastation it caused. Sometimes it’s hard to believe that, for all our technology, mother nature can still get the best of us. Thanks Erin. I think it left a mark on me somehow. Last night I had a horrible nightmare in which I was trying to save my son from falling trees -and this despite the fact I didn’t really feel we were in direct danger at the time. My vivid imagination!